This week's guest post is by Anne Perdue who writes about the promotional book tour as a voyage of self-discovery. Anne Perdue is author of I'm a Registered Nurse Not a Whore, and you can read more about her book tour on the Let's See How Far This Car Can Go Blog. When Insomniac Press offered to publish I’m a Registered Nurse Not a Whore, I was ecstatic. But it was also a time of profound sorrow and loss, as my mom had passed away in Vancouver four days prior. Amidst the bitter sweetness an idea came to me. I would celebrate my book and share it with my mom by driving her ’89 Mustang across the country. On an old-fashioned road trip book tour. And if the old car broke down on the Coquihalla, well that’d be as far as the tour would go. It seemed like a great idea until I realized I had no concept of how to venture forth on a book tour. I decided to begin with something concrete, or rather asphaltic, namely roads. Using CAA triptiks I determined routes and travel times. Using the Canadian Booksellers Association website I researched bookstores. I placed calls, sent emails, wrote press releases, made more phone calls and plotted my trip, all the while imagining the stunning drive and the interesting conversations I’d have with readers, writers, strangers … And then came the waves of insecurity and self-doubt. Just who did I think I was? Writers don’t go on book tours anymore unless they’re famous best-selling authors. What exactly was I endeavouring to do? On a personal note I knew I’d discover how far I could travel outside my comfort zone, since like many introverts, if there’s one thing I’m not naturally suited to it’s a publicity tour. As preparations continued I began to understand that it would also be an act of faith. Faith that there are good reasons, sometimes, to take risks by embracing the unknown and the impractical. After all, there’s not a lot of money in writing fiction, especially short fiction. Apparently there’s not much money in publishing it either. Or selling it for that matter. And people don’t read much any more. And this adventure was going to cost me time and money. So why bother? The day my book tour began was April 14, my mom’s birthday. As I made my way to the airport I thought about my mom’s quiet intelligence and voracious reading habits, and how much she would have loved to hear about my trip — all of the who, what and where of it. And from that point on I rarely asked myself what I was doing. I just did it. From booksellers who were welcoming and gracious, to perfect strangers I met in gas bars and coffee shops who told me a bit about their lives and, upon learning the purpose of my trip, instantly asked if they could buy a book — I was constantly aware of what a privilege it is to be part of the book world. Many of my most whorish moments became the most memorable. Such as the night I spent on a BC Ferry trying to convince the chief steward to let me sell my book in the gift store, while she held firm that there were rules around those kinds of activities, and managed to come up with a new one every five minutes. Or the time I caught word of a private book club meeting and brazenly crashed it, telling a group of surprised wine-drinking women how much I would really love it if they would consider reading my book. As the tour continued I became more adept at approaching strangers. I worked out a gentle way to address the lone customer perusing the fiction aisle. For groups of two or more, who ambled into a store appearing unsure what they were looking for, I would jump up and down, and gregariously wave them over. And for every time I was met with a look that said, back off weirdo, there were a dozen times when I was met with an open smile, interest and even gratitude. One day, after giving a reading, I was talking to a woman about how we all have to pay the bills. About how we’re judged — sometimes harshly and often with prejudice — by how we make a living. About how sometimes we have to do things that make us feel like whores, and sometimes we do things that help others and we feel like registered nurses. I mentioned that no matter how we make a living, whether as a nurse or a whore, a doctor or a Walmart greeter, if we do our job well and treat others with kindness, we earn the right, and it’s an equal right, to dignity. I asked her what she did. Actually, I’m a Walmart greeter, she said, admitting she didn’t care for the store, or her job, but that she was in survival mode and needed to do something. I think I’m going to love your book, she told me, adding, I can hardly wait to get home to read it. Such real encounters are very humbling. I was always thankful and honoured every time someone would share something personal with me, like the woman who approached me after I read from a story about a married couple and, in the quietest voice, told me how much she missed her husband who had passed away a few years prior. 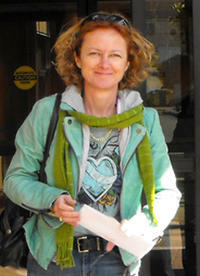 Or another woman who told me she was very sorry, she’d really like to buy my book but she couldn’t. I’ve had way too much life lately, she said. I can’t handle any more right now. When I decided to visit Perdue, Saskatchewan, a village named after my Great Grandfather, I had no idea what to expect. What I discovered was a welcoming, vibrant community, just west of Saskatoon, with approximately 500 citizens. There’s a community centre, parks, school, daycare, restaurants, Hotel, service station, assembly plant, credit union, and last but not least, one incredibly well-stocked bookstore. Ralph Crawford moved his bookstore to Perdue, from New Brunswick, in 2005. Spending a half-day browsing in his store, with its 300,000 books, I think I gleamed a little insight as to why he’s there. He likes living in a community where real estate isn’t more precious than people, where everyone stops to talk to each other, and where no matter what your interests might be he can find a book for you. And he lives surrounded by what he loves: books. When he insisted on buying 25 books from me, cash, right out of the trunk of my mom’s car, I knew I’d come face to face with an act of faith that was far more profound than my own endeavour to embrace the unknown. 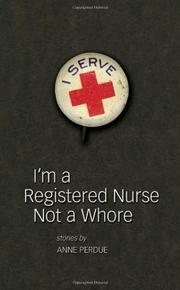 It was an act of faith in books, readers, himself, me, and in I’m a Registered Nurse Not a Whore. Many times while I was on the road I thought about a short story by Ali Smith. True Short Story begins with the narrator of the story observing two men in a coffee shop. In response to their manners and gestures, the narrator begins to conjure the nature of their relationship. But then stops. Because it feels wrong. And listens instead, to what they are talking about. Which happens to be literature. It’s a brilliant reminder that life and fiction are each other’s inspiration. Going on a book tour is very different to writing fiction. It takes place in real time and you can’t rewrite what happens. You need to know exactly what day is it, and whether or not there are any gas stations within 100 kilometers … that have gas. You need to engage people, you need to share, and you need to listen. And yet for all the ways in which it’s different, it has its own fiction-like beauty. In fact, it’s a pretty darn fantastic way to spend a couple of weeks. I understand that the long pen may suit some travel-weary writers, and perhaps I’m naive or as doomed as Willy Loman, but I’ll take the long road and a ballpoint any day.